I have run and/or hiked many a technical course or trail in my day. 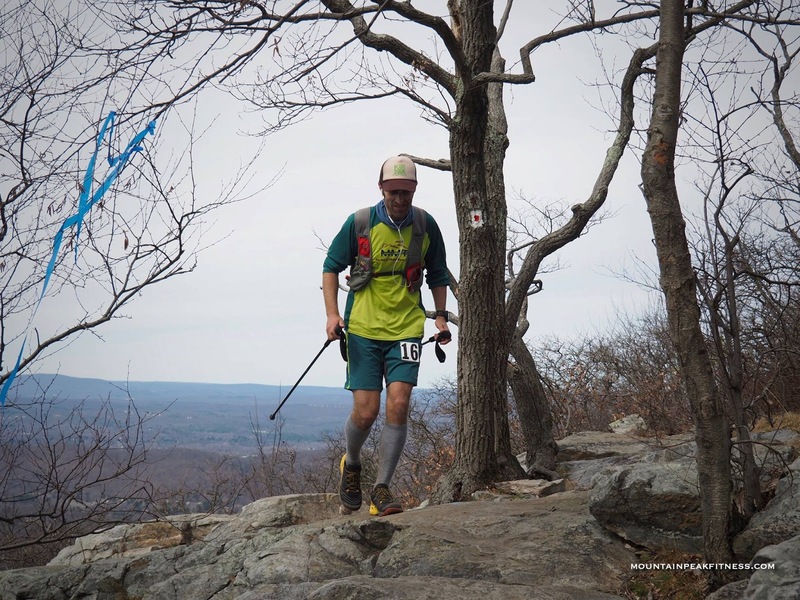 Certainly there's the Rothrock 30k course, which is simply littered with all sorts of fun and difficult-to-navigate rocks. 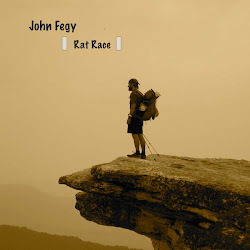 Or, perhaps a better example would be the HURT 100 course which requires constant vigilance to avoid the myriad roots. One of the best examples I can think of is the Manitou's Revenge course which was simply in a class of its own. Obviously there's also Barkley, but that's technical for different reasons. 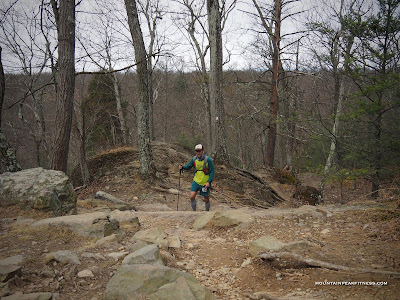 There were certainly many sections along the AT, PCT, or even CT that required all sorts of tricky navigation or technical prowess...but nothing exemplifies this better I think than Eastern PA / Western NJ. 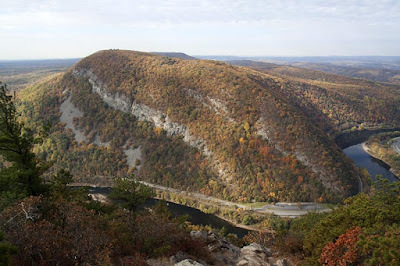 You ask anyone thru-hiker about their experience on the AT, and which parts were the "most difficult", you will often get responses about Eastern PA, or Western NJ...sections known amongst hikers as the "places where hiking shoes go to do". The rocks are ruthless and relentless. There no way to avoid rolling a few ankles, and shredding at least one pair of shoes there. Just mention "Lehigh Gap" to any thru-hiker, and they will probably grimace and give you a look that says something along the lines of...."oh man, that section was dreadful". At any rate. 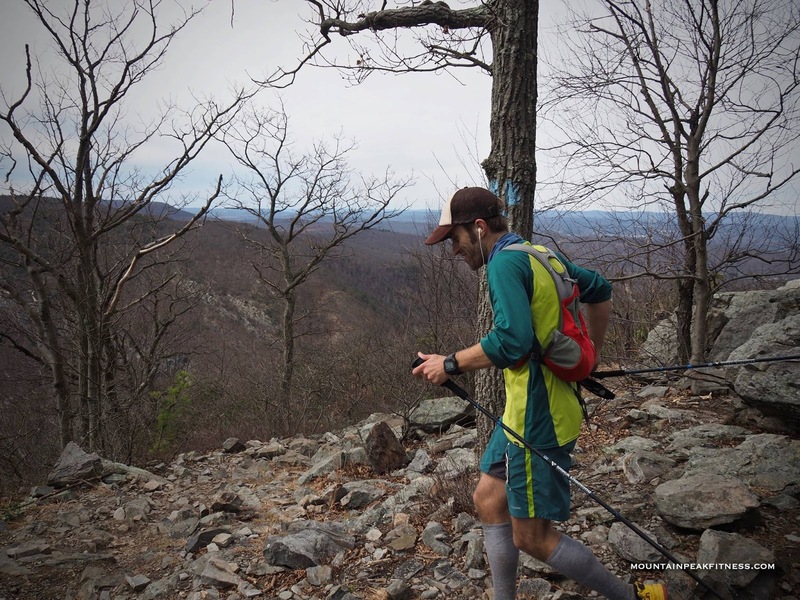 I had no plans of racing hard (as I had a really long and mile-filled week last week with several climbs up Mt. Wellington in Tasmania (4000' gain each), and a weekend full of running in the Tasmania Trail Festival (I'll write up a full report on all this soon). I really just wanted to get in the full ~40 miles, and the 13000' of gain. I thought I had read that the time limit was 12 hours (Turns out it was really 10, but I only found this out after the run). Doing any repeat course is difficult. Doing a course like this...10 times, is incredibly difficult. 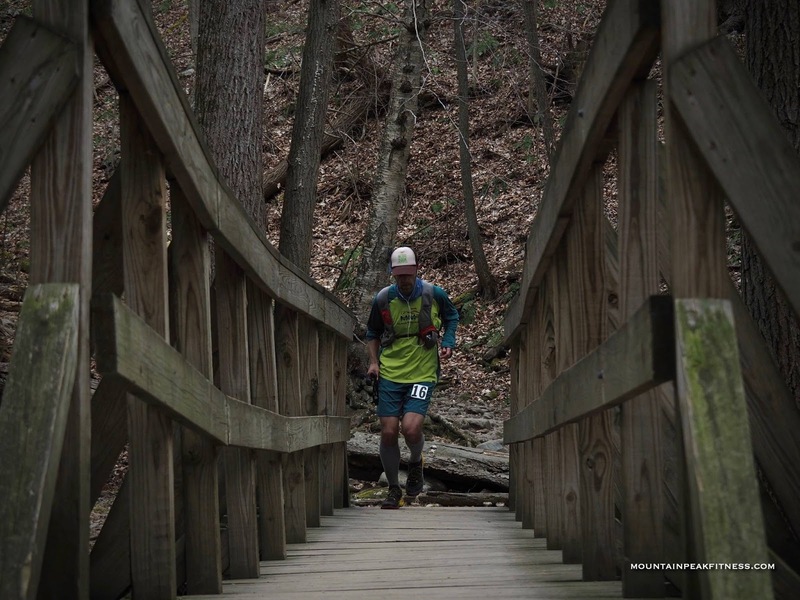 I knew the mental challenge would be tough alone, so I tried not to think about it, and simply enjoy the beautiful day and think of it just as a 40-miler. I drove down to the Delaware Water Gap area early in the morning and showed up just before the race start. There were probably about 40 of us crazies lined up to have a go at the 10 loops. I was simply geeked out to get to some good climbing. Caught with my pants down....pinning on my number. The first loop brought the true reality check. The climb was tough, but manageable. What really surprised me was the difficulty of the subsequent descent. It was littered with thousands of small pointy rocks, arranged such that it was very difficult to find solid footing while trying to run. 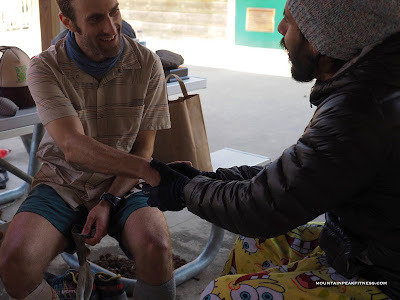 It truly was mentally exhausting constantly scanning the ground for good footing. It took a lot of focus. 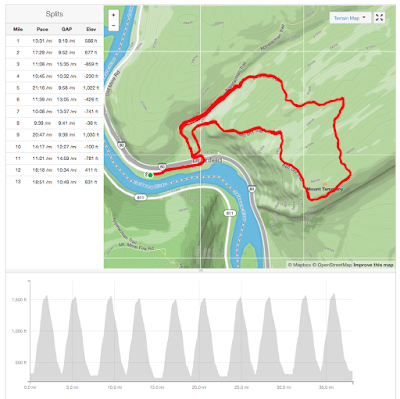 I opted for no trekking poles for the first 4 loops, and soon realized that was probably a bad decision. So at the start of my 5th, I grabbed my poles and never dropped them. 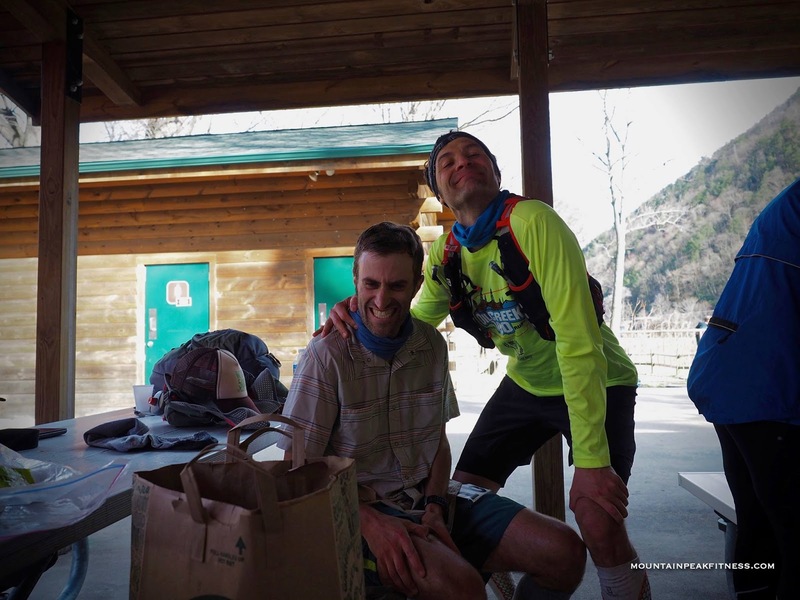 The course was set up such that you left the parking area and ran down the road to the trail head on odd numbered loops, but only returned all the way to the parking area after even number loops. 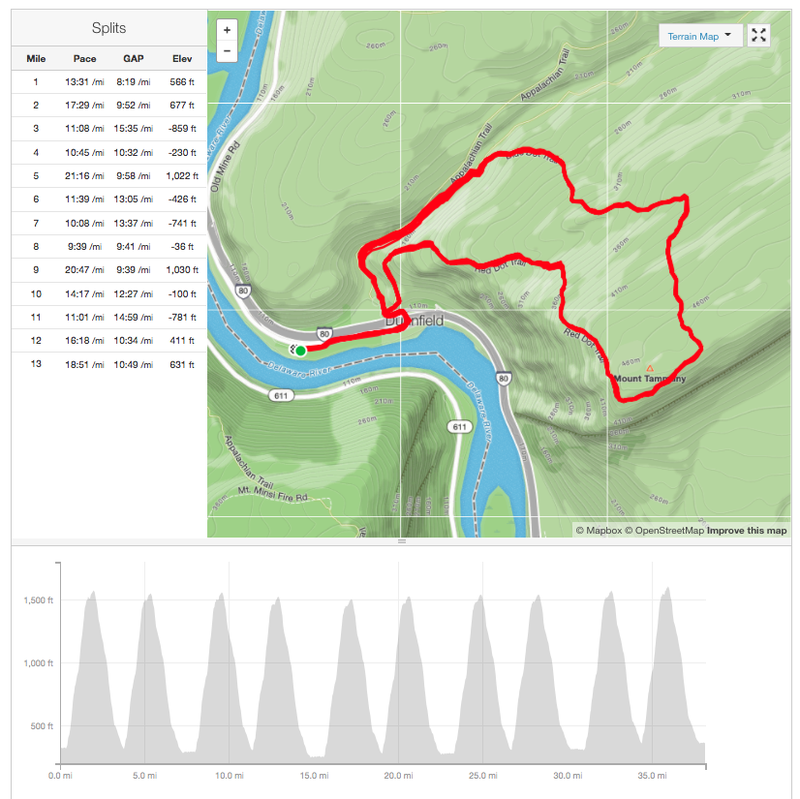 So when transitioning from say lap 1 to lap 2, we simply started another loop right from the trail head. I had no real time goal other than to try and keep it at about an hour per loop. This would result in a 10 hour race. Seemed like a good number. My first few laps, were all in the low 50's for minutes, so I was slowly making a cushion for myself off of the hour-per-loop mentality. But, as the day went on, my laps slowly creeped down a few minutes per loop, until about lap 7 when I bagged my first 60 minute loop. After about 6 or 7 laps, it was tough to stay motivated, despite my adequate times, and decent performance. I simply was getting tired of the same loop. So naturally, I tried to enjoy the scenery a bit more. When I'd get to the top of the climb, I started spending a few minutes enjoying the vista/view and trying to take in the surroundings. Sure it cost me a little time, but it probably saved me mentally. I was certainly struggling to maintain enough motivation to finish out the final 3 laps. But I just kept ticking them off 1 at a time. 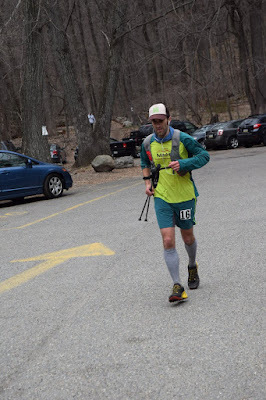 Soon I was leaving the aid station parking area for the last time starting loop 9 and I knew I was in good shape to finish. I took it nice and easy on 9, and it was my slowest lap (about 65 minutes). When I finished off the loop though, and began my final lap, it was a really great feeling knowing I was on my last climb of the day. I really took it slow and tried to enjoy it. I had over 90 minutes to finish the loop and still finish under 10 hours, so I knew I was golden on the time front. At the top I spent about five minutes relaxing on a rock and enjoying the great view. When I finally started my last descent, my body was definitely feeling it. I had not taken any salt all day, and many of my muscles were aggressively cramping. I knew it was going to be a long drive home, so I tried to go very easy on that descent. Very gingerly I popped out of the woods after 2 miles and ran the short road section back to the parking lot and very-happily finished with a time of about 9 hrs 27 minutes. I was thrilled...and other than my body being a bit torn up, felt as though I completed my goals for the day. I had some real problems with cramping post-race, and kept seizing up while trying to change my clothes. It was quite embarrassing actually. And the ride back home....well yeah...that was pretty rough. 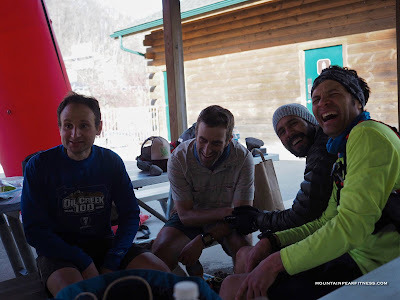 Turns out that while there was a 12-hour time limit on finishing the race, the true Tammany 10 challenge meant doing 10 loops, with over 10k of gain, in under 10 hours. So I had also completed the challenge. 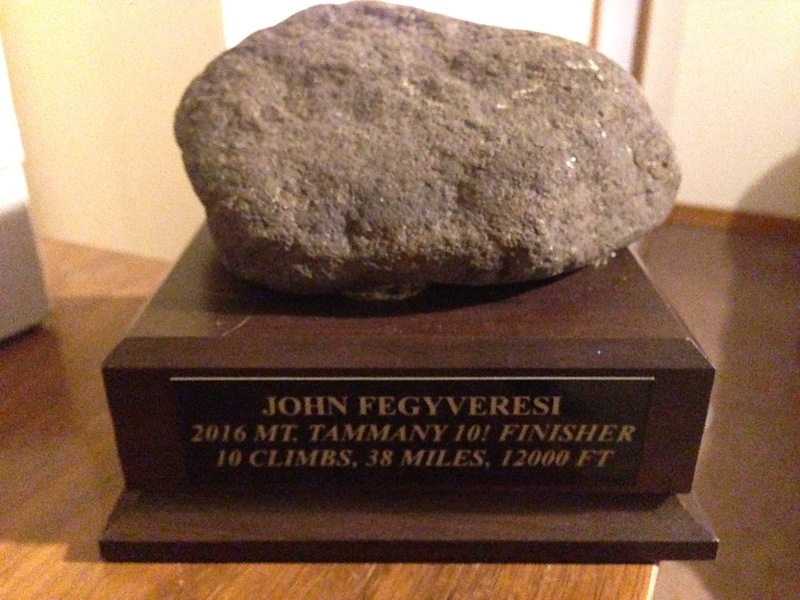 My prize was a rock mounted on a wooden platform (with nameplate), and a homemade apple pie (Probably the single greatest finishers award I've ever won). On a side note, I used this course as a test for some new shoes....and man did I put them through wringer. I wore a new pair of Sportiva Akasha's...and they held up great. They had just the extra beefiness I was looking for over the Mutants. Great shoe so far. I look forward to playing in them some more. 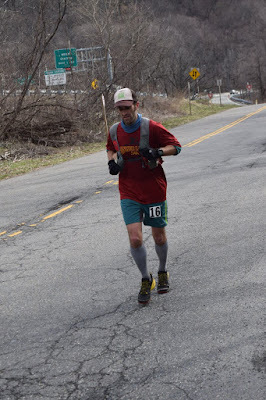 At the end I chatted with several folks about the Barkley all while my legs were cramping up. Some lovely pictures were taken during these exchanges. Grimacing as my leg is seizing up. Had a lot of fun running alongside these guys all day. Really great people at this event.